When The Residents started making music in the ‘60s, they were musical novices who came at composing with an outsider’s viewpoint. Taking inspiration from like-minded mavericks like Stockhausen and Captain Beefheart, they began writing songs that meshed avant-garde and pop sensibilities, jettisoning time signatures and sonic clarity in favor of an alien, unidentifiable style. Listeners had to pay close attention if they wanted to penetrate the band’s mysterious resonance. Early on, the quartet decided to produce their art collectively and anonymously. 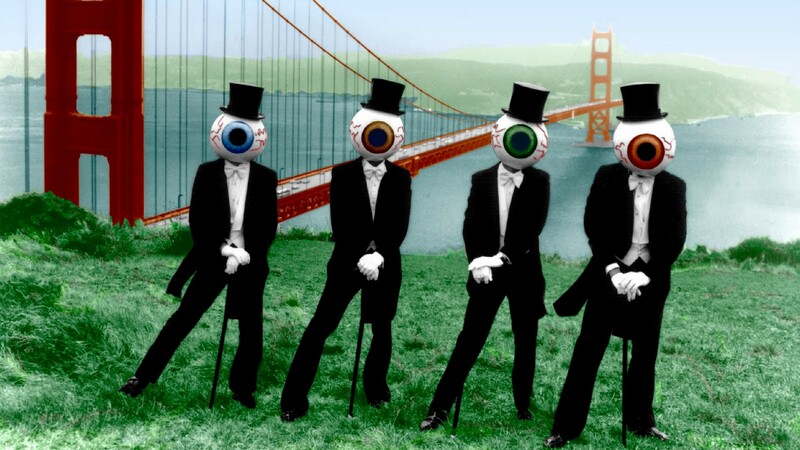 Fifty years later, they still remain faceless, although the giant eyeball masks they began wearing in the late 70s have become recognized worldwide as the band’s trademark. The Residents pioneered the use of music videos and helped create what is known today as performance art with their elaborate stage shows, but they’ve never given an interview or been photographed out of costume. To celebrate their 50th Anniversary, they’re unleashing three new projects: their first novel, a noir-tinged opus called The Brick Eaters; Intruders, an album of new music and I Am A Resident, a mash up of tunes they remixed from material sent in by their fans. Homer Flynn, the band’s graphic designer and president of The Cryptic Corporation, the company that oversees the band’s various projects – music, art, video, stage shows and novels – spoke to The Globe to discuss the quartet’s latest projects. they work together on it? The Residents are an ongoing collaboration, so everything that comes out has input from everybody. There was one writer, but everybody participated. Things are batted back and forth, badminton style, and ultimately they wound up with something that seemed to satisfy everybody. The inspiration came from two articles in the New York Times. One, about a career criminal in this mid ‘60s, in poor health, that had spent most of his life behind bars. He was released and, amazingly, his wife stuck with him through all this. He promised her to go straight and went back home to the South. He managed to stay honest for six months, then stole a Cadillac and started holding up formal wear rental stores. His health was so bad, he was on oxygen. He was waving a gun in one hand and holding an oxygen bottle in the other. After a couple of holdups, he got chased by the highway patrol, flipped the Caddy and died. The other story was about a content screener, a guy who worked for an Internet company. He investigates the complaints people have about users on site. Most websites have a box you click if you think content is inappropriate. Those messages go to a content screener. He gets to sift through the dregs of humanity and decide what gets to stay or go. The Residents created characters based on those stories and brought them together to see what happens. The narrator is a middle aged, alcoholic, LA writer. His wife just left him, so he gets on a plane and flies out to the scene of the car crash. Everything spins backwards from there. You’ve been doing readings on behalf of The Residents to promote the book. How do the fans respond to you promoting the novel? The bookstores let people know they aren’t going to get four people in costumes putting on a show. It’s just a reading. As long as expectations aren’t high, people seem to be fine with it. I’ll be doing a reading at City Lights books in San Francisco’s North Beach on Halloween that will be more elaborate, but I can’t go into any details. Tell us about the I Am a Resident album. The band solicited cover versions from their fans to help generate excitement for a new album and then put them together on a CD. How many submissions did they get? Why did they remix them, rather than present the originals, as sent in by the fans? I Am a Resident is going to be a two-disc album. One will be the seven mash ups The Residents worked on and one will have 24 of the original songs, as they were sent in. The original idea was to compile songs from the fans, but when the submissions came – they got 197 – a number of them were of such high quality that they revisited the original idea. They decided to create mash ups and incorporate as many of the 197 songs as possible. They used bits and pieces and some fairly lengthy chunks, but they’ve been mangled and altered. Personally, I think it’s surprisingly good, given that the material comes from such varying sources. When I listen to it, it’s both hauntingly familiar and completely wrong at the same time, in a way I found delightful. Not unlike the original Residents versions. Tell us about the process of making Intruders. Is there an overarching theme to the songs? We all get stuck with imaginary or imagined beings in our consciousness. They may be based on someone we have a strong connection with, or a relationship with, then they start spinning around in our minds until they become unrecognizable. The best example is an ex-boy friend or girl friend you can’t get out of your mind. Each of these imaginary beings, based on a personal obsession, becomes an intruder. Each song is its own example of that. The previous Residents album was The Ghost of Hope. It was about train wrecks and it was extremely factual in its basis and the lyrics. It was about real train wrecks from the late 1800s and early 1900s, with the text taken from newspaper articles from that time. They wanted to go more inward this time, not concentrating on things that were factually based. Half of the basic tracks were written in the summer of 2012 but, for one reason or another, there was never the right project for these pieces. When the idea of intruders took root, about a year ago, they felt this material would be suitable, so the idea of intruders became the unifying concept of this body of material. The Residents have been working with Eric Drew Feldman as co-producer since The Ghost of Hope; he helped shape the material in its final stages. The album has the usual mix of songs and jarring sonic experiments. Does this mix come naturally? How much work goes into the arrangements? The shape each project takes dictates itself. Even at times when they set out to do something different, the project goes its own way. There’s never any premeditation about what the form is going to be. They like to relax and let it find out what it wants to be on its own.